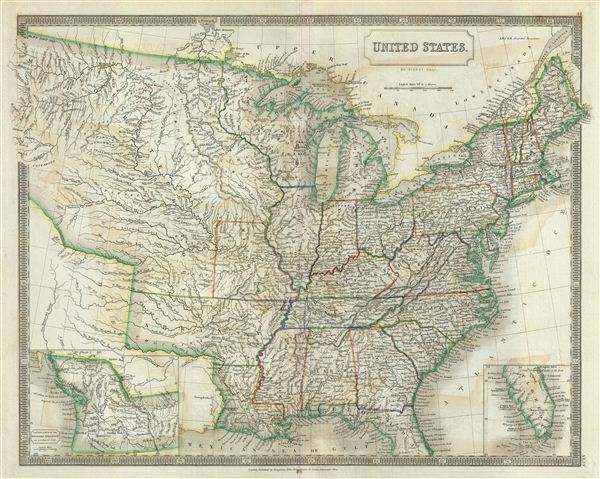 A beautiful example of Sidney Hall's 1835 map of the United States. Hall's map covers the United States from the Atlantic seaboard westward as far as Oregon and the Pacific and from the Great Lakes southwards to southern Florida. Florida and Oregon are reserved as insets appearing in the lower left and right quadrants, respectively. As this map predates the Mexican American War and the annexation of Texas, Upper California and Texas are not yet part of the United States. An early state and territorial configuration is presented with Arkansas extending from the Mississippi to Texas, a unified Virginia, and Wisconsin identified as the Northwest Territory, embracing modern day Minnesota. The vast territory explored by Louis and Clark is here identified as the Missouri Territory. Hall, as C. Wheat notes in Mapping the Transmississippi West, closely followed Louis and Clark (with the 'Stinking water'). Curiously Hall's concedes all of British Columbia to the United States as far north as 54 40,' a highly unusual move for a British cartographer. In the first half of the 19th century the Pacific Northwest was the last frontier in the century's long slaughter of the American beaver in the name of European fashion. Both the British, in the name of the Hudson Bay Company, and the Americans, championed by John Jacob Astor's Pacific Fur Company, were eager to claim monopolistic right over the region. Astor's establishment of Fort Astoria on the Columbia River, marked here but not specifically named, only served to further tensions with the Northwest Company - the Pacific subsidiary of the Hudson Bay Company. The dispute escalated, giving rise to the Oregon Boundary Dispute and the American expansionist slogan 'Fifty-four Forty or Fight!' The dispute was not resolved until the 1846 Oregon Treaty which, through concessions on both sides, formally set the boundary at the 49th parallel. The name 'Oregon,' we note, appears nowhere on this map. Very good. Minor wear and verso repair along origianl centerfold. Original platemark visible. Some offsetting. Blank on verso. Rumsey 4224.045 (1830 edition). Philips (Atlases) 758. Wheat, C.I., Mapping the Transmississippi West, no. 385-6.